The U.S. Coast Guard says it’s still looking into what caused damage to underwater electric cables and oil pipelines in the channel that connects Lake Huron and Lake Michigan. Cmdr. Shaun Edwards declined to comment Tuesday on an announcement by Michigan Attorney General Bill Schuette that his office was bringing civil action against VanEnkevort Tug & Barge of Escanaba, Michigan. Schuette says a company vessel dragged an anchor along the Straits on Mackinac on April 1. Edwards says Schuette’s move was separate from the investigation led by the Coast Guard and includes other federal, state and tribal agencies. Edwards says that after the investigation is finished, any mariner who acted wrongly could lose credentials or be referred to the Department of Justice for a criminal investigation. Officials say two underwater remote vehicles will examine the damaged cables and pipelines. A Michigan company blamed by the state attorney general for damage to underwater electric cables and oil pipelines says it’s cooperating with the investigation. Attorney General Bill Schuette said Tuesday that his office is bringing a civil action against VanEnkevort Tug & Barge, based in Escanaba, Michigan. 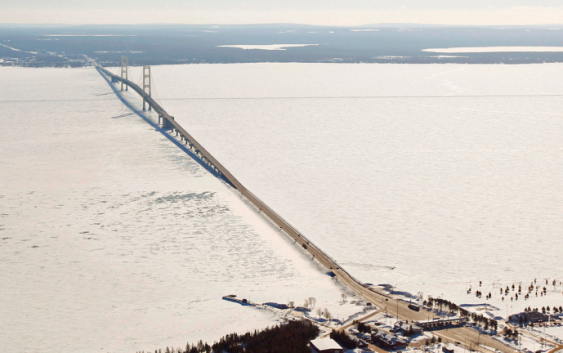 Schuette says a VanEnkevort vessel dragged an anchor through the Straits of Mackinac shipping channel April 1 at the time two submerged cables and two oil pipelines were damaged. The straits connect Lakes Huron and Michigan. The cables leaked 600 gallons (2,270 liters) of insulation fluid containing mineral oil and benzene. Enbridge Inc. says its oil pipelines were dented but the lines’ integrity wasn’t compromised. Michigan’s attorney general says a tugboat dragged its anchor as it passed through the waterway connecting Lake Huron and Lake Michigan, causing recent damage to underwater oil and electrical lines. Attorney General Bill Schuette said in a statement Tuesday that he notified Vanenkevort Tug and Barge that he’s planning civil action against the company because of the damage believed to have happened April 1 in the Straits of Mackinac. The Associated Press sent an email seeking comment from Vanenkevort, based in Escanaba, Michigan. Two electric cables leaked 600 gallons (2,270 liters) of insulation fluid containing mineral oil and benzene. Enbridge Inc.’s twin Line 5 pipelines carry crude oil and liquefied natural gas. The company has said that the pipelines were dented, but said the integrity of the lines weren’t compromised.